When you think Disney - you think magic, fairies, sparkle and wonder. But how do you re-create the fairy tale magic that is Disney in your high school gym or auditorium? Can you really put flying carpets, enchanted roses, noses that grow on cue, men turning into beasts on a stage in a high school? The answer in short, is yes. Here at MTI, we got thinking about some practical tips and tricks to help bring the wonder of Disney musicals to life on the smaller stage. But these are just our suggestions - we'd love to hear your creative thoughts as well. We hope you'll share your ideas and experiences with us by commenting on this post, or visiting the Forums and Show Pages on MTI ShowSpace! Tip 1. A little bit of practical thinking can provide a lot of practical magic. We all know the transformative love story that is Disney’s BEAUTY AND THE BEAST. This story first took form as an animated film with music by legendary Alan Menken (LITTLE SHOP OF HORRORS and The Little Mermaid) and lyrics by the late departed Howard Ashman. Following Ashman’s death, famed British Lyricist Sir Tim Rice (AIDA and ALADDIN JR.) worked with Menken to write seven new songs for the Broadway version to accompany the book by Linda Woolverton (AIDA). The show was a critical success and is the seventh longest running show in Broadway History. So, how can you recreate the enchanted castles and animated objects such as the little rascal Chip and the oh so important Rose? Well, turns out there are some surprisingly simple ways to make a Rose with petals that wilt and fall off on demand. Several resourceful MTI ShowSpace users shared their ideas. One MTI ShowSpace user simply got two roses, which were switched in blackouts and mounted on an up-lit glass dome brought on e-bay. An incredibly inventive idea is to actually have a human rose played by a child, as described by Mary Todd Kaercher: “We had a human rose with a collar of rose petals and three loose ones she dropped at appropriate moments. At one point she took the collar off and at the end only one was left. The collar was a green wide ribbon and petals were made of red paper crushed and shaped. We stapled the petals and simply tied the ribbon around her neck. She wore green leggings, a cute little green skirt with ruffles and a green top.” Simple and effective. To read more of Mary Todd’s creative ideas click here. From roses to noses. Ok, you can make a paper rose, you can even buy mechanical ones but how do you make the nose of a young boy grow when he’s telling lies? In MY SON PINOCCHIO: GEPPETTO’S MUSICAL TALE, Book by David Stern, Music and Lyrics by infamous Stephen Schwartz (GODSPELL, PIPPIN), fairies are present and of course, so is that famous nose. One MTI Showspace user provides this deceptively simple idea for the nose. “We used a small telescoping looking glass (pirate toy) with the lens taken out and rigged with elastic to fit on the actors face.” No high tech expensive equipment needed, just a little practical thinking to create some practical magic. To check out photos and ideas from other productions across the country click here. Tip 2. There’s a lot of help if you only ask. On each of the shows MTI Showspace community pages are links and ads from many wonderful companies offering their help and advice. For example, a renowned magician even offers his services for those doing productions of BEAUTY AND THE BEAST. But what about the bigger picture, literarily. 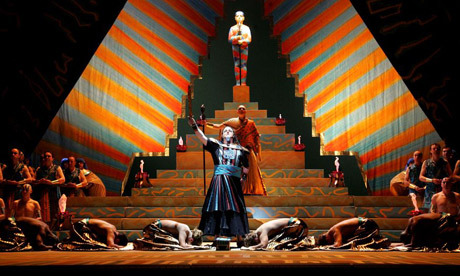 How do you evoke the dusty heat and immense size of the Egyptian Pyramids in a show like AIDA (Music by Elton John, Lyrics by Tim Rice Book by Linda Woolverton and Robert Falls and David Henry Hwang?) How do you conjure up ancient lands of genies and flying carpets for ALADDIN? Well, actually you can hire them! There is a wealth of companies both local and national who do nothing but rent out backdrops, set pieces both large and small. There are companies who cater to professional regional tours as well as your local High School production. Sometimes community theaters also rent out sets after a production too. Just check out MTI ShowSpace's Community Rentals to have a look. Also, don’t forget other high schools in your area who’ve done a production. Most schools love to share their costumes, sets and any other tips they picked up along the way. At the Texas Educational Theatre Association (TETA) conference in early 2005, Gilberto Zepeda, drama director of PSJA (Pharr - San Juan - Alamo) North High School, requested permission to perform a "dual-language" adaptation of ALADDIN JR. as outreach to the area's substantial Spanish-speaking population. Dsiney Theatrical Productions granted permission in fall 2005 for this experiment and hired L.A.-based playwright José Cruz González to work with Zepeda and DTP dramaturg Ken Cerniglia to adapt ALADDIN JR. (book by Jim Luigs based on the 1992 film, music by Alan Menken, lyrics by Howard Ashman and Tim Rice). Two languages were woven into the plot with the goal of having both English-speaking and Spanish-speaking audiences follow the story easily without boring bilingual audiences. At the first production students designed and built all the sets themselves as well as every single bit of costume. Many hands make light work and you don’t always have to hire professionals. Just watch this short documentary below to watch how a diverse community came together for this show and all that they learned along the way. Tip 3. The magic is in the story - and they all lived happily ever after. At the end of the day the real magic of all Disney musicals is in their essence and music. The audiences get lost in the wonder of the story itself and the performances – and that’s where the real pixie dust can be found! So if your budget allows you no more than a pair of leftover Halloween horns and your auntie’s old cloak, you’ll still be able to wow audiences and transform any stage into a magical kingdom. And hopefully now you’ll see that every day household objects can become singing teacups, growing body parts and enchanted objects with just a little inventiveness and a spoon full of sugar.